How Far is Voora Gitanjali? 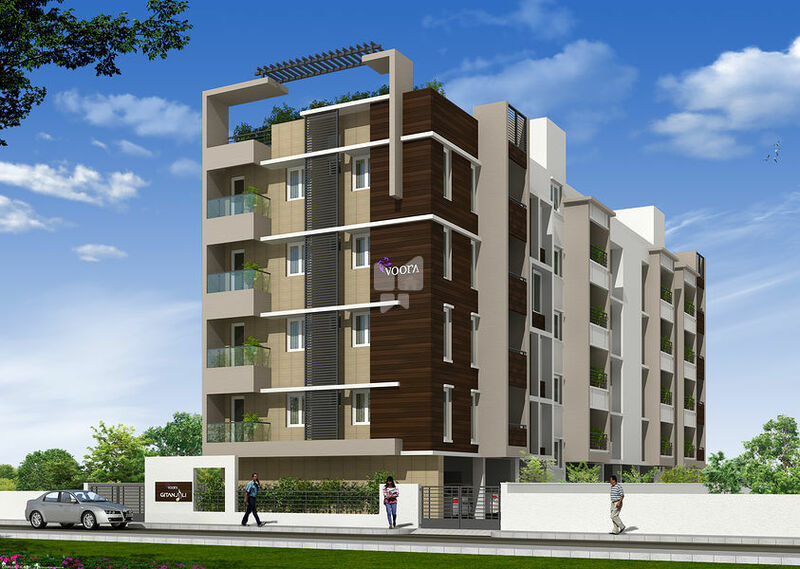 16 wonderful 2 and 3 BHK luxury abodes reserved for a select few. 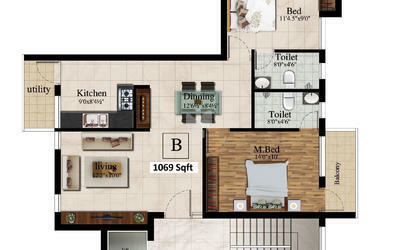 Discover stunning homes spread between 1069 sq. ft. & 1260 sq. ft. across 4 grounds, that are absolute masterpieces. Located on the Sarangapani Street in T.Nagar, Voora Gitanjali ensures that you are just a hop away from schools, colleges, shopping avenues, hospitals, transport facilities and every other modern day comfort that you may require. Voora Gitanjali encapsulates the best of luxury that includes a fully equipped air-conditioned gymnasium, 24×7 generator back up and lots of other amenities. Voora Gitanjali is a dream come true, thanks to its fabulous location & amazing luxuries. By Reinforced Cement Concrete frame structures with clay brick partitions. The height of each floor shall be of 9'-6" to ceiling level. Living / Dining and Bedroom: Marble flooring provided with polish and finished with Tin Oxide. Kitchen: Nitco / Kajaria / Graffiti tile flooring, Concept tiles above the counter up to a height of 2'0". Master Bedroom: Wooden Laminated flooring AC4 Grade. Door Shutters: Main doors shall be 40mm thick teak panel door shutters. Window Shutters: UPVC window system. Hardware: All hardware shall be in CP Brass, tower bolts, doorstoppers, ball bearing hinges. Locks shall be mortise of Dorset or equivalent make. 20mm thick Kitchen Granite counter top slab will be provided. Kitchen Sink: Stainless steel sinks with drain-board shall be provided in the Kitchen. Doors & Windows: All doors outer face finished with Polyurethane coating and inner face with melamine finish. External Walls: Exterior grade weather shield emulsion, texture paint or as suggested by Architect. Concealed plumbing lines from the overhead tanks for each floor (Finolex of equivalent I class HDPE pipes). All closets and wash basins will be white - Kohler/Equivalent. Provision for plumbing in connection one geyser in each toilet. Hot and cold mixes for shower and tap for each toilet (Jaquar CP equivalent fitting/continental/Florentine). 3 Phases will be provided for each flat with automatic phase change - over switch. Standby Generator (noiseless) of adequate capacity with automatic change over switch for all common area requirements such as lift, pump, lighting etc. Required number of pumps with motors for bore well water and corporation water from the sump with standby pumps and motor along with proper housing. Power supply for all flats and extended to all rooms, fans and light points.